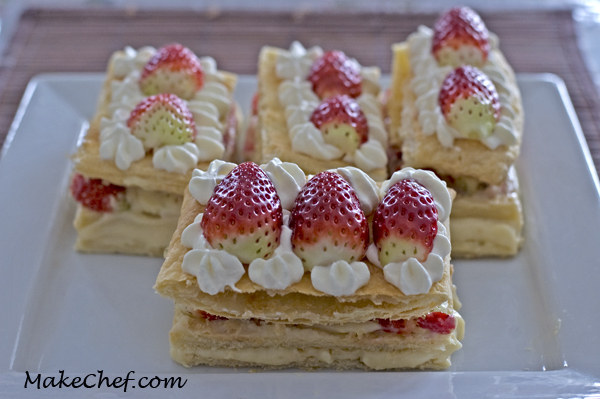 I absolutely love Mille-Feuilles, probably because of its multilayers of texture. As always I wanted to try a recipe with less sugar. 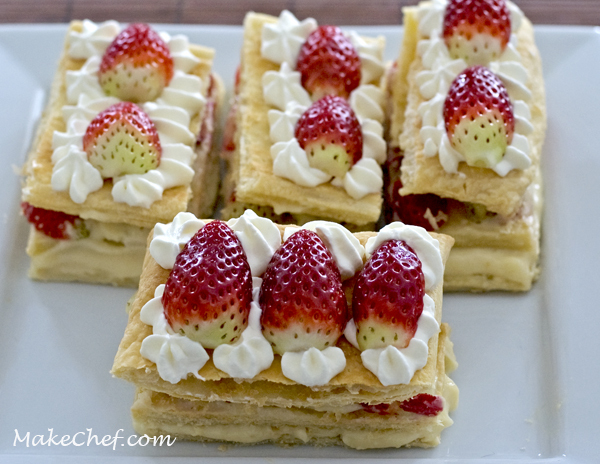 I started by leaving out the frosting that covers the top pastry layer in most Mille-Feuilles recipes. Instead, I decorated the top with no added sugar whipped cream and fresh strawberries/blackberries. 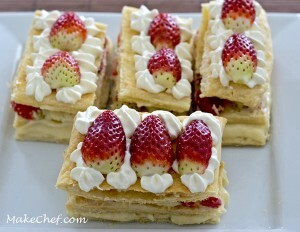 I also added fruits in the middle layer instead of using jam. On low heat, gently warm about 1¾ cup milk in a saucepan. To a bowl, add the flour to the remaining 1/4 cup milk, mix until well combined. Beat in sugar, eggs and vanilla extract until mixture is light and fluffy. Add about 1 cup of warm milk to the flour-egg mixture. Add mixture to the remaining warm milk over low heat. Stir gently until the mixture thickens and is cooked. Remove from heat and transfer into a bowl. Place a piece of plastic wrap in contact with the surface of the mixture. Once at room temperature, refrigerate the mixture until completely chilled. 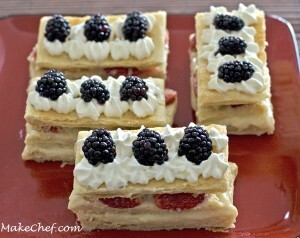 Roll out the puff pastry into a 12×20 inch rectangle and cut into 3 rectangles of 4×20 inches each. Prick the surface of the dough with a fork. (At this point you can choose to brush the dough with milk and sprinkle with the sugar. I purposely left out the sugar and milk). Place the puff pastry on a baking sheet lined with parchment paper and bake in preheated oven at 400°F for about 15 minutes, rack in middle position. Let the pastry cool to room temperature on a cooling rack. Beat the cream with an electric mixer until peaks form. (I did not add any sugar to the whipping cream. For a sweeter version, you might want to add about 2 tbsp sugar for every cup of cream). Cover or pipe one layer of custard over a first layer of puff pastry. Cover with a second sheet of puff pastry. Pipe a second layer of custard and cover with strawberries/blackberries. Cover with the third sheet of puff pastry. 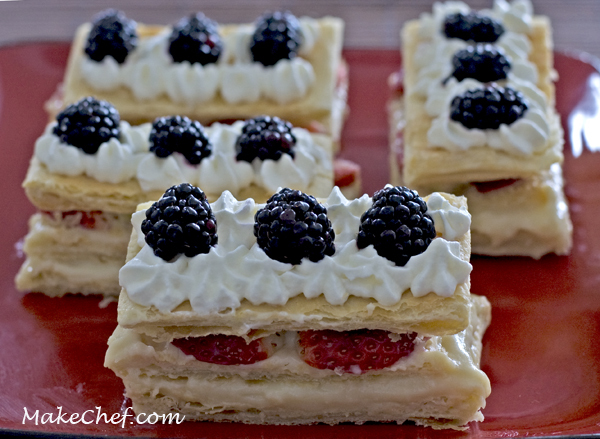 Pipe the whipped cream on the puff pastry and decorate with the fruits. Cut into 8 equal pieces. Serve chilled. 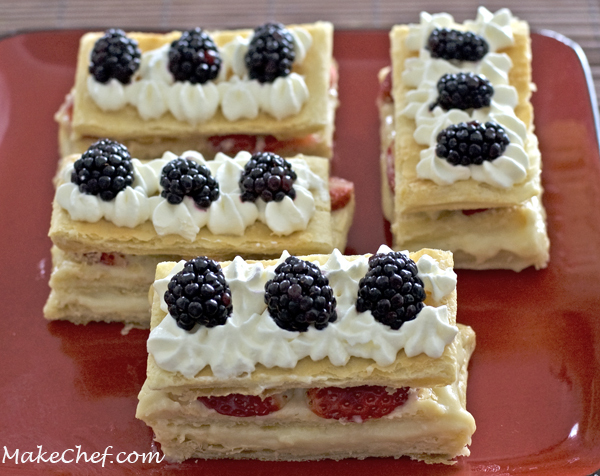 This entry was posted in Dessert, Flour, Recipe and tagged blackberries, mille-feuilles, puff pastry, strawberries.